You can participate and earn a no-nonsense 25% share of our gross commission by introducing whisky and whiskyinvestdirect.com to your friends or your own website's visitors. It takes two minutes to set up and continues earning you respectable money for years. You continue to generate commission income at the same rate on repeat business for a full 2 years from account creation - and many WhiskyInvestDirect customers deal repeatedly. Becoming an affiliate is simple. First go to www.whiskyinvestdirect.com and Register, so that you have a WhiskyInvestDirect account. Please note that you will need to validate your WhiskyInvestDirect account to withdraw any proceeds. Please remember to change MYUSERNAME to the WhiskyInvestDirect username you chose when registering. Please note that the above referral URL structure is the only way referrers can link to WhiskyInvestDirect. If you use any other URL structure then you will not receive any commission. If you are looking to refer only one or two friends, another way we can record your referrals is on the WhiskyInvestDirect registration page in our marketing drop-down called "How did you first find WhiskyInvestDirect?" 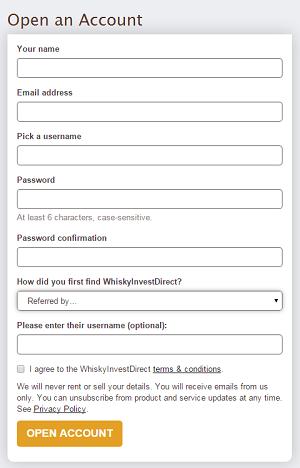 In the drop-down is a field called "Referred by" which allows your friend to enter your WhiskyInvestDirect username in the "Please enter the username" box. Please remember again to change MYUSERNAME to the WhiskyInvestDirect username you chose when registering. You can choose an altenative banner image from our banner catalogue. Use your referral links on your site, blogs, emails, message boards, personal social media pages etc. If you have any questions or would like more information regarding the WhiskyInvestDirect Referral Programme or any other marketing query please contact us at . In addition to the referral programme, we appreciate direct links to www.WhiskyInvestDirect.com. Commission shares are passed to you the instant your referred customers trade, so you'll also see your earnings reflected in your account balance and online statement. Please note that you will need to validate your WhiskyInvestDirect account to withdraw any proceeds. You are entitled to receive commission at the stated rates (25% of WhiskyInvestDirect's gross commission) where you are responsible for introducing a WhiskyInvestDirect customer via an appropriate link - according to the procedures of the referral program. You are entitled to receive commission at the stated rates (6.25% of WhiskyInvestDirect's gross commission) where a new WhiskyInvestDirect customer was referred by someone you referred - according to the procedures of the program. You understand a prospective user coming to WhiskyInvestDirect via your referral link may not register an account during that visit. In order to track these prospects, WhiskyInvestDirect will seek to place a 2-month cookie on their computer system, identifying you as the referrer. You acknowledge that the expiry of the cookie on a referred customer's machine within two months of the referral during which time the prospect has neither registered nor visited the WhiskyInvestDirect site causes the cookie containing your referrer id to be expunged. You acknowledge that housekeeping utilities in use by the visitor may cause the cookie to be expunged before the time period is up, and that in this event WhiskyInvestDirect is not expected to identify you as the first referrer. Only referrers using the prescribed referral URL structure as detailed above will generate commission. Existing WhiskyInvestDirect customers whose details are already held on the WhiskyInvestDirect database will not be included in the commission share if they open a new account via your referral links. You acknowledge that while your account will be credited immediately when you start earning commissions you will need to validate your WhiskyInvestDirect account in line with existing WhiskyInvestDirect customer terms and conditions. If you have not validated your account within 8 weeks of starting to earn commissions we will begin charging you a late validation penalty fee of £20 per month until your account is validated. You will not refer your own accounts or those of your spouse. You understand that where doubt exists WhiskyInvestDirect may prevent withdrawal of referral earnings until a reasonable number of accounts have been referred and funded. All material offered for your use remains copyright of WhiskyInvestDirect/Galmarley Ltd. By reproducing it in any way — whether by email, website, print or any other medium, and including substantive amendments — you hereby agree to use this material solely for promoting WhiskyInvestDirect alone. WhiskyInvestDirect will not tolerate any abuse in its name of international "anti-spam" regulations. Infringement will result in the loss of all referral income, howsoever generated. In promoting WhiskyInvestDirect by email, you hereby accept liability for ensuring your lists are up-to-date, "opt in" only, and fully compliant with your local data protection legislation. You will not register any domain names or register keywords, search terms or other identifiers for use in any search engine, social media network, portal, sponsored advertising service or other search or referral service or include meta tag keywords on their website that incorporate terms which are identical to, similar to or could be reasonably confused with WhiskyInvestDirect services and/or Website, trademarks (or other trademarks owned by WhiskyInvestDirect) and you will at all times comply with such guidelines for the use of WhiskyInvestDirect’s services and website and trademarks as may be issued from time to time. You may be contacted by WhiskyInvestDirect to change the referral tracking links you are using and associated html code. You will have 45 days to action this request. If any of the above actions are undertaken we will halt your commission and freeze your account. If your WhiskyInvestDirect account is closed you will cease to earn any referral commission from the users you have referred that are linked to your account. These are WhiskyInvestDirect’s Referral Programme Terms and Conditions as of 25th May 2018. These terms and conditions are subject to change with 30 days notice to active referrers.